Meteobridge does support upload of weather camera images from Ubiquiti $100 IP Camera "AirCam" to Weather networks like WU and other places in the Internet. Just released version 2.0 of Meteobridge does give additional options. Instead of an AirCam in your LAN you can use any image for upload that can be accessed by an URL. This comes handy, when you already have a webcam that uploads an image via FTP to somewhere in the Internet. Meteobridge just needs the URL and to make use of it. Meteobridge allows to place weather data as text into your weather cam image. 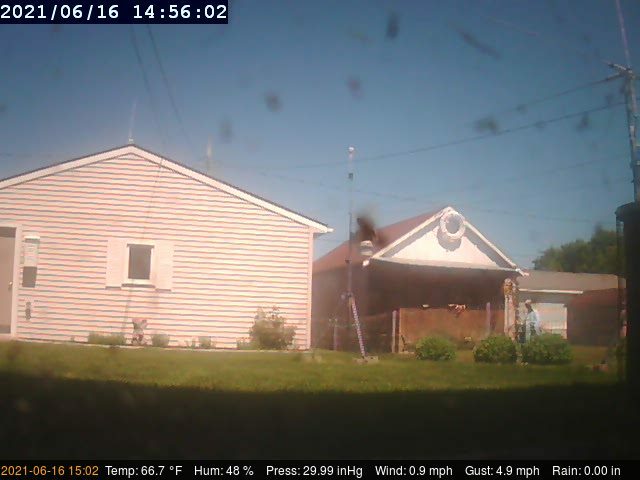 This is done by uploading the image (local AirCam or remote URL) to the Meteobridge server and telling the server what kind of text overlay to add to the image. Overlays are defined in terms of Linux "convert" options and therefore you have total control of the look (text size, text color, coclor boxes, transpareny, image resizing) of resulting image. Meteobridge does provide some predefined overlay definitions to get you started with building your own. Attached you find an example of such a convert definition and what the result is. Placement of current weather data into the image is done by using Meteobridge variables. That works exactly like when including weather data into HTML pages, emails or tweets. Images that Meteobridge does upload to Meteobridge server and the converteed image contaiing weather data text are accessable as Internet URLs. -resize 852x480 -fill black -draw "fill-opacity 0.7 rectangle 0 460 852 480"
-pointsize 12 -fill orange -draw "text 5 475 '[YYYY]-[MM]-[DD] [hh]:[mm]'"
Gust: [wind0wind-max5=mph.1:--] mph Rain today: [rain0total-sumday=in.2:--] in'"
Where does the "Meteobridge Weather Cam" actually upload to? It shows "success" in the live data page, but I don't know where it uploads to. Can you give some guidance on how I can view the image uploaded. I looked around on the Meteobridge forum and the support page, but I can't seem to find the location of the uploaded file. Also, on the FTP page under "Push Services" I have it set to upload the fetched image from here http://www.miraculon.net/wxcam.jpg to http://www.miraculon.net/mb_wxcam.jpg. There is no text overlay showing on the mb_wcam.jpg being uploaded by Meteobridge. Will the FTP version to my own site include the overlay? I selected the Imp. EN (AirCm 1.2) Template on the Weather Network page. I think that this will be a really great addition to Meteobridge, if I can learn how to "drive" it. I think that I found it. I clicked the icon on the "Meteobridge Weather Camera" item +text and I found it. Frickin' awesome! Thanks for the additional functionality. Yeah, so does my StarDot Netcam. But that is not really relevant is it? Doc, that image processing syntax looks suspiciously like Imagemajick's. Is it?? I had to disable some functions in order not to compromise the server (i.e. direct writes to the file system, etc), but most of convert's power is there. I will post some more examples later on.